The Asian American Student Union and Wildcats Forever hosted the Wildcats Pho-Ever dinner Sunday evening at the Frith Community Center as part of an annual tradition to get Kansas State students acquainted with Vietnamese cuisine. 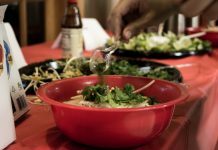 K-State students were invited to eat pho, a Vietnamese noodle soup consisting of broth, rice noodles, herbs and a choice of either chicken or beef. A vegetarian option was also available for students who purchased tickets in advance. Attendees were able to add toppings to their pho including chives, cilantro and sprouts. Jackie Huynh, former AASU president and senior in hospitality management, said the annual event began five years ago and has continually grown in size. The first year, the dinner was attended only by the four AASU executive officers. This year, 60 people purchased tickets. “The people in attendance are mainly K-State students, but I want Manhattan and Junction City people to attend to make it a county-wide event to bring more people,” Huynh said. This was the first year the group partnered with Wildcats Forever. The partnership was considered a success by Jordan Peyton, vice president of AASU and sophomore in biological systems engineering. The dinner also featured a raffle of candy, movies and cookware with winners chosen throughout the night. The money raised from tickets will go to support students attending the Midwest Asian American Student Union conference and other events. 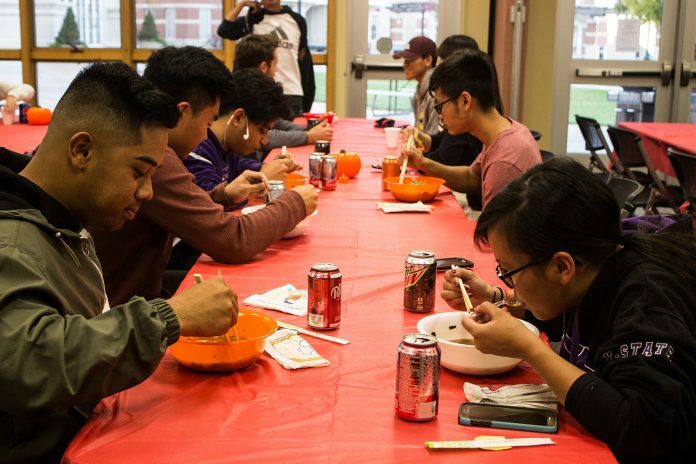 Other events hosted at K-State by the AASU include the Taste of Asia, a free event for students to try Asian foods such as kimbap, spring rolls and dumplings. Students interested in joining the AASU can attend meetings held every other Tuesday at 7 p.m.